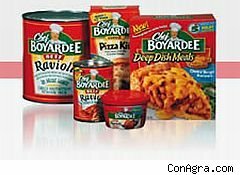 Leading brand name food and beverage companies, including those who make Healthy Choice and Chef Boyardee, have begun phasing out the controversial chemical bisphenol A (BPA) amid growing consumer and regulatory concern about the health risk it poses, a new report says. The report, by environmental investor firm Green Century Capital Management and shareholder advocacy group As You Sow, surveyed 26 companies in the food, beverage and retail sectors on how they were responding to mounting public pressure to restrict the use of BPA. The chemical is commonly found in the lining of food and beverage cans and is linked to serious chronic diseases. Hain Celestial, H.J. Heinz and ConAgra lead the pack for their swift move in switching to BPA-free linings for some products and for setting a timetable for eliminating the substance altogether from the rest. Their brands include Health Valley, Earth's Best, and Westbrae Natural (Hain); Chef Boyardee, Hunt's and Healthy Choice (ConAgra), and Heinz Tomato Ketchup. General Mills, owner of the Progresso and Green Giant brands, received a "B+" for having eliminated BPA from its Muir Glen line of canned tomatoes. Nestle, which has been testing alternative packaging and has committed to retire BPA within 1-3 years, also scored high. "Companies are actually moving faster than regulators in phasing out BPA from food and beverage packaging," said Emily Stone, a co-author of the report, in a statement. She added that on the whole, businesses are "wasting no time" in transitioning out of BPA can linings. This is important because despite evidence that BPA contributes to obesity, diabetes and cardiovascular disease, there are no regulations that limit its use in the United States. Earlier this year the Food and Drug Administration even got sued for failing to act on a citizen petition filed almost two years ago and asking for a ban on BPA. The laggards still outnumber the leaders, according to the report: Coca-Cola, Del Monte, Kraft, and Walmart all got a failing grade, while Whole Foods and Kellogg received a "D+". McCormick, the herbs and spices maker, and Campbell Soup got a solid "C."
An earlier edition of the study, released in April 2009, had found that most companies were not sufficiently proactive in trying to eliminate BPA. Last week, BPA was officially declared toxic in Canada.